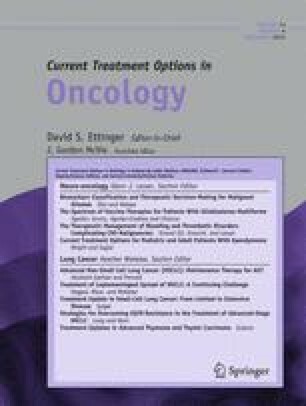 Patients whose tumors harbor somatic-activating mutations within the epidermal growth factor receptor (EGFR) gene define a clinically distinct molecular cohort of lung cancers with increased sensitivity to the EGFR tyrosine kinase inhibitors (TKIs), including the “first-generation” reversible inhibitors, erlotinib and gefitinib, and the “second-generation” irreversible inhibitors, afatinib and dacomitinib. Several, large, phase III studies have shown already that patients with EGFR-mutant tumors display radiographic response rates of >60 % and improved progression free survival (PFS) when treated with an EGFR TKI compared with chemotherapy. Unfortunately, despite these initial responses, patients inevitably develop progressive disease, a concept referred to clinically as acquired resistance. Novel strategies are needed to delay or overcome acquired resistance to EGFR TKIs. These strategies include second-generation EGFR inhibitors, rationale combinations of targeted small molecule inhibitors and/or monoclonal antibodies, and addition of traditional cytotoxic chemotherapy to EGFR TKI therapy at the time of progression. Unfortunately, to date, there is no genotype-specific standard of care, and enrollment of patients with acquired resistance to EGFR TKIs into clinical trials specifically addressed at overcoming resistance is paramount to continue to advance the field and to improve outcomes for these patients. C.M. Lovly: none; L. Horn: travel/accommodation expenses covered or reimbursed by Boehringer Ingelheim for travel to IASLC South American Regency Meeting.